Le Jas du Boeuf is located 3 km east of Cruis, a small village classified as a “site of character” that has a bakery and a general store, a bistro, a gourmet restaurant, a primary school, a doctor, and a medieval church. Cruis owes its existence to a Roman toll road that ran straight through the village. You can see a 10 m stretch of the original alignment between the Jas and the village. There is also the Stone of Cruis, thought to be a medieval or even older solar clock, along with some medieval tombs just outside of the village, near Montlaux. After slumping to as low as 200 people in the 1960s, Cruis has now regained the 600 residents it had in the 1800s. 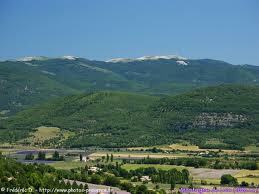 The Jas is just 2 km west of a smaller village, Mallefougasse-Augès, which is 10 km from the exit at Les Mées of the A51 that runs up from Marseille to Sisteron and points north. Called the Pays de Forcalquier, this region lies halfway between the Alps and the Mediterranean and between the Lure and Luberon mountains. It is a land of contrasts, with a variety of very different landscapes and an exceptional wealth of wildlife, plants and heritage. We recommend staying for several days and making day trips to Forcalquier (markets on Monday and Thursday) and Banon (market on Tuesday), which now has the largest independent bookstore in France. 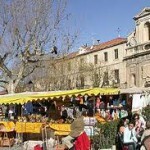 Closer but smaller markets can be enjoyed on Saturday in Cruis and on Wednesday in Saint Étienne-les-Orgues. The Observatory of Haute-Provence at Saint Michel l’Observatoire offers tours, multimedia shows and evening sky-watching thanks to the clearest skies in Europe. Longer days trips would be to Aix-en-Provence for the latest fashions and cultural events at either end of the Cours Mirabeau, one of the most beautiful urban landscapes in Europe, or you could head east to the Verdon Gorge, one of the most beautiful canyons in Europe. Even if you are not much of a hiker, spending an hour or two walking along the many paths up or simply along the mountain is well worth it. 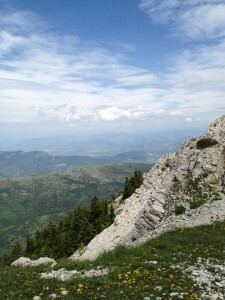 The views are amazing, especially if you drive up to the top of the Lure (1,826 m), and there is very little risk of running into anything other than the odd hare, unless you’re driving back at night when you need to keep an eye open for wild boars and the occasional deer. Whether it’s goat cheeses from Banon, olive oil from Lurs, herbal apéritifs from Forcalquier, or the latest products from Occitane or Lothantique, the region remains a reflection of traditional provençal lifestyles so good food and wine is just around the next corner. Cruis itself boasts 13 official labels (AOCs and IGPs) testifying to the authentic production and provenance of agricultural products, including essential lavender oil, olive oil, honey, lamb, apples, Banon cheese and local wines.